Air pollution is the introduction of particulates, biological materials, or other harmful materials into the Earth's atmosphere, possibly causing disease, death to humans, damage to other living organisms such as food crops, or the natural or built environment. It is estimated that more than 1 billion people are exposed to outdoor air pollution annually. Urban air pollution is linked to up to 1 million premature deaths and 1 million pre-native deaths each year. Urban air pollution is estimated to cost approximately 2% of GDP in developed countries and 5% in developing countries. Rapid urbanisation has resulted in increasing urban air pollution in major cities, especially in developing countries. Over 90% of air pollution in cities in these countries is attributed to vehicle emissions brought about by high number of older vehicles coupled with poor vehicle maintenance, inadequate infrastructure and low fuel quality. In this unit we will look at the factors involved in the formation of urban air pollution and strategies to control air pollution. The combustion of fossil fuels produces primary pollutants that may generate secondary pollutants and lead to photochemical smog, the levels of which can vary by topography, population density and climate. Photochemical smog has significant impacts on societies and living systems. 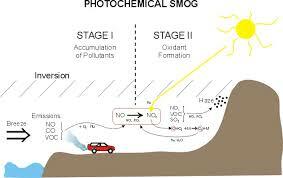 Photochemical smog can be reduced by decreasing human reliance on fossil fuels. 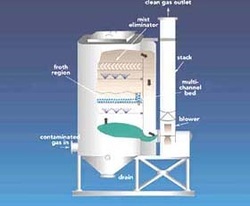 Outline the solutions to ground-level ozone. Why is there still ground-level ozone? Suggest how photochemical smog is likely to change in the decades to come. 6.3.U1 Primary pollutants from the combustion of fossil fuels include carbon monoxide, carbon dioxide, black carbon or soot, unburned hydrocarbons, oxides of nitrogen, and oxides of sulfur. When fossil fuels are burned, two of the pollutants emitted are hydrocarbons (from unburned fuel) and nitrogen monoxide (nitric oxide, NO). Nitrogen monoxide reacts with oxygen to form nitrogen dioxide (NO2), a brown gas that contributes to urban haze. Nitrogen dioxide can also absorb sunlight and break up to release oxygen atoms that combine with oxygen in the air to form ozone. ​6.3.U2 In the presence of sunlight, secondary pollutants are formed when primary pollutants undergo a variety of reactions with other chemicals already present in the atmosphere. 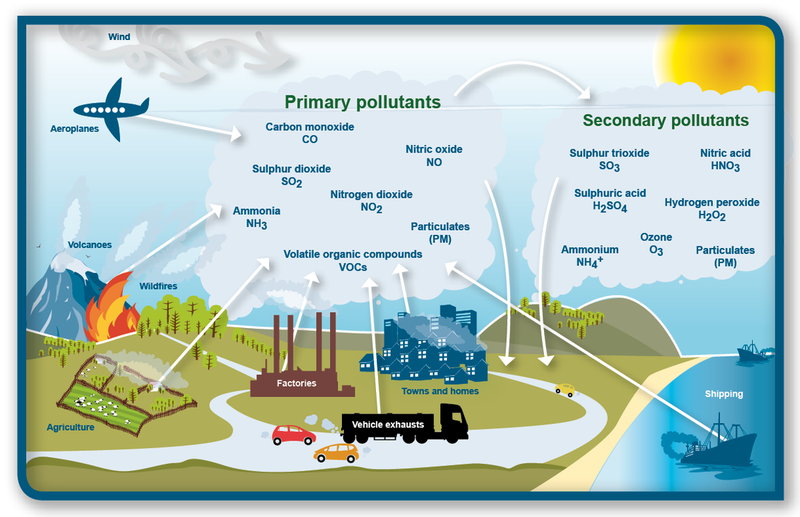 Secondary air pollutants are produced in the air by the interaction of two or more primary pollutants or by reaction with normal atmospheric constituents, with or without photoactivation. Secondary pollutants are not directly emitted as such, but forms when other pollutants (primary pollutants) react in the atmosphere. 6.3.U3 Tropospheric ozone is an example of a secondary pollutant, formed when oxygen molecules react with oxygen atoms that are released from nitrogen dioxide in the presence of sunlight. Ozone occurs naturally at ground-level in low concentrations. The two major sources of natural ground-level ozone are hydrocarbons, which are released by plants and soil, and small amounts of stratospheric ozone, which occasionally migrate down to the earth's surface. Neither of these sources contributes enough ozone to be considered a threat to the health of humans or the environment. Tropospheric ozone can act both as a direct greenhouse gas and as an indirect controller of greenhouse gas lifetimes. As a direct greenhouse gas, it is thought to have caused around one third of all the direct greenhouse gas induced warming seen since the industrial revolution. The ozone that is a byproduct of certain human activities becomes a problem at ground level. 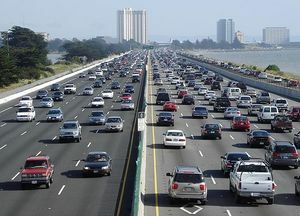 With increasing populations, more automobiles, and more industry, there's more ozone in the lower atmosphere. Since 1900 the amount of ozone near the earth's surface has more than doubled. Unlike most other air pollutants, ozone is not directly emitted from any one source. Tropospheric ozone is formed by the interaction of sunlight, particularly ultraviolet light, with hydrocarbons and nitrogen oxides, which are emitted by automobiles, gasoline vapors, fossil fuel power plants, refineries, and certain other industries. 6.3.U4 Tropospheric ozone is highly reactive and damages plants (crops and forests), irritates eyes, creates respiratory illnesses and damages fabrics and rubber materials. Smog is a complex mixture of primary and secondary pollutants, of which tropospheric ozone is the main pollutant. Ozone affects plants in several ways. High concentrations of ozone cause plants to close their stomata. These are the cells on the underside of the plant that allow carbon dioxide and water to diffuse into the plant tissue. This slows down photosynthesis and plant growth. Ozone may also enter the plants through the stomata and directly damage internal cells. Rubber, textile dyes, fibers, and certain paints may be weakened or damaged by exposure to ozone. Some elastic materials can become brittle and crack, while paints and fabric dyes may fade more quickly. When ozone pollution reaches high levels, pollution alerts are issued urging people with respiratory problems to take extra precautions or to remain indoors. Smog can damage respiratory tissues through inhalation. Ozone has been linked to tissue decay, the promotion of scar tissue formation, and cell damage by oxidation. It can impair an athlete's performance, create more frequent attacks for individuals with asthma, cause eye irritation, chest pain, coughing, nausea, headaches and chest congestion and discomfort. It can worsen heart disease, bronchitis, and emphysema. 6.3.U5 The frequency and severity of smog in an area depends on local topography, climate, population density, and fossil fuel use. 6.3.U6 Thermal inversions occur due to a lack of air movement when a layer of dense, cool air is trapped beneath a layer of less dense, warm air. This causes concentrations of air pollutants to build up near the ground instead of being dissipated by “normal” air movements. Precipitation cleans the air and winds disperse the smog. Thermal inversions trap the smogs in valleys (for example, Los Angeles, Santiago, Mexico City, Rio de Janeiro, São Paulo, Beijing) and concentrations of air pollutants can build to harmful and even lethal levels. The primary way trees are burned is by slash-and-burn agriculture. The trees are cut down and then burned to clear the land for farming. Biomass from other biomes, like savannah, is also burned to clear farmland. The pollutants are much the same as from burning fossil fuels: CO2, carbon monoxide, methane, particulates, nitrous oxide, hydrocarbons, and organic and elemental carbon. ​Burning forests increase greenhouse gases in the atmosphere by releasing the CO2 stored in the biomass and also by removing the forest so that it cannot store CO2 in the future. As with all forms of air pollution, the smoke from biomass burning often spreads far and pollutants can plague neighboring states or countries. 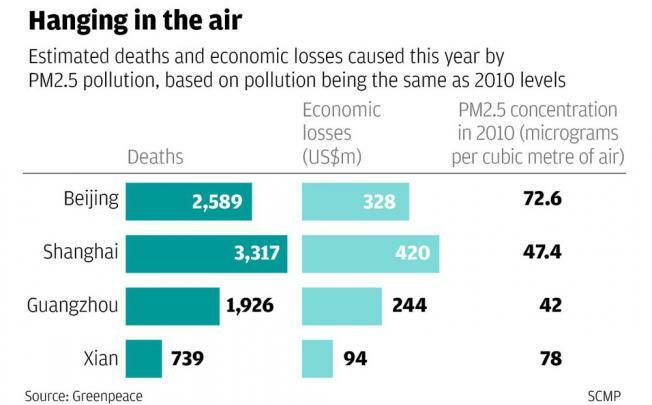 6.3.U8 Economic losses caused by urban air pollution can be significant. Poor air quality is one of the most serious environmental problems in urban areas around the world, especially in developing countries. Adverse health effects from short and long term exposure to air pollution range from premature deaths caused by heart and lung disease to worsening of asthmatic conditions and can lead to reduced quality of life and increased costs of hospital admissions. Measures to reduce fossil fuel combustion should be considered, for example, reducing demand for electricity and private cars and switching to renewable energy. Refer to clean‑up measures, for example, catalytic converters. Electricity - Reduce consumption of electricity through building design, small scale green power on city buildings e.g. solar, wind, locale power stations away from urban areas. 6.1.A1 Evaluate pollution management strategies for reducing photochemical smog. The global rise of urbanization and industrialization has led to an increase in urban air pollution. Environmental problems are often emotive—under what circumstances should we maintain a detached relationship with the subject matter under investigation? In this video Paul Andersen explains how air pollution is any chemicals in the atmosphere that negatively affect human health. Primary pollutants (like CO, VOCs, NOx, SO2, PM, and Lead) as well as secondary pollutants (like Ozone, nitric acid, and sulfuric acid) are included. Regulation of air pollution and technology can mediate the health threat. A segment on how air pollution affects urban populations. Produced by the Science & Medical Journalism Program at UNC-Chapel Hill. The air pollution in Mexico City is a serious problem that is shown in this short video. 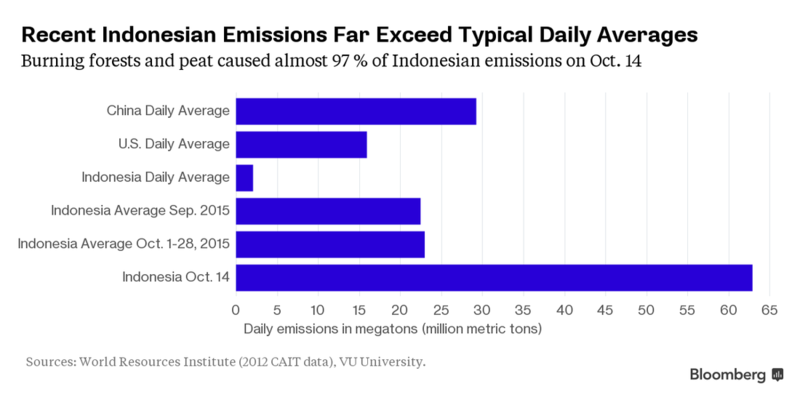 Air pollution is a global pandemic that's underway. It's a major health challenge yet nobody talks about it. It affects everyone but we usually ignore it cause we can't actually "see" it. Now it's time to talk about it and find a way to solve it together. Air pollution effects everyone and TXU Energy is proud to partner with environmental organizations like the North Texas Clean Air Coalition.